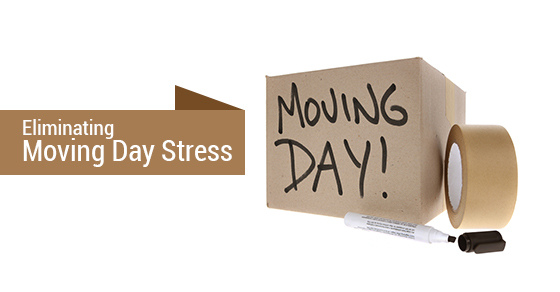 Moving day can be an incredibly stressful experience. There is enough preparation and coordination involved that one small misstep can accidentally send your stuff to Hamilton, Ohio instead of Hamilton, Ontario. There are a lot of ducks to get in a row before you move, but these tips will help keep you organized and relieve any stress the day might bring! When packing, label each box properly so that when you arrive at your new home, you know exactly where to put everything. Don’t spend your first day in your new place going through un-marked boxes trying to figure out where everything goes. Get a good night’s sleep. This is easier said than done but if you can muster up enough zzz’s to have you feeling refreshed the day of your move, that’s one of the best and easiest ways to remain stress free on a hectic day. Don’t leave anything until the last minute. If you have to spend your last night in your old place packing, you won’t be able to get ample sleep and will exhausted by the time the morning hits. Try and get everything packed and coordinated at least two days before you move. Do check with your vet before leaving to make sure your dog or cat has the required shots for travel. Some countries, especially those in Europe, require a pet to be quarantined for a long period of time before they are even allowed to entre the country. Pack a small bag as if you’re going away for the weekend. When you get to your new house, you’ll want toiletries and a change of clothes to be easily accessible. Instead of tearing open boxes trying to find your pajamas, keep everything handy in an overnight bag. Stretch first. If you haven’t hired movers to take care of the heavy lifting, you’re likely going to be overusing your muscles while moving your furniture. If movers aren’t in the budget, get as many strong friends and family members as you can to help you out. Stretch before doing any heavy lifting and keep the Tylenol handy just in case you overextend your muscles. Be frank with the movers. When working with a moving company be as direct with them as possible. Tell them that they need to be careful with your boxes even if they’re not labeled “fragile”. Most movers are good people and will be gentle with your stuff but there are a few bad apples who just want to get the job done and go home. After the packing and loading is completed, tour your home one last night. Make sure everything is gone and that you haven’t left important stuff behind. Follow the truck. If you’re not the one driving the moving truck, follow it closely behind in your car. If something goes wrong, the truck hits a pothole or the driver gets a speeding ticket, you’ll want to be there. Most importantly, decide what isn’t a necessity in your new home and rent a storage unit for those belongings! There’s no use cluttering up your new home while you have so much painting, organizing and decorating to do. Give yourself ample space by storing your non-essentials to retrieve at a later date.